Washington State University researchers-turned-entrepreneurs have developed a method for growing trees three times faster while conserving water and reducing the need for pesticides – and they just made their first sale. Read the full article by Kate Wilhite at WSU News. 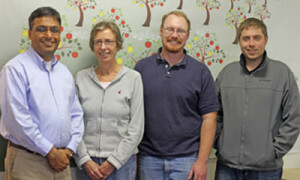 Phytelligence founders Amit Dhingra, left, Kathie Nicholson, Tyson Koepke and Scott Schaeffer. Not pictured are Nathan Tarlyn and Derick Jiwan. From savoring the distinctive, flavorful crunch of an apple to eyeing the plump, crimson cherries adorning mouth-watering summer produce displays, people love fruit. But few perhaps know fruit like Washington State University horticulturist Amit Dhingra, who looks beyond the pits and leaves into the genome of these sweet treats. Read More. Amit Dhingra was one of the 15 featured speakers at the inaugural TEDxWSU event. He talked about engaging graduate students in working directly with farmers and solving their problems. There’s a growing demand for graduates in agriculture, and students who invest two years at Walla Walla Community College or Yakima Valley Community College can transfer to several ag degree programs at Washington State University. Read the rest of the story by Rachel Webber at WSU news. A professor, a graduate student and a team of farmers and researchers are doing some digging to learn about root rot.“It’s all about survival,” said Amit Dhingra, an associate professor in the Department of Horticulture. Read more at the Daily Evergreen. Scientists at Washington State University have discovered ripening compounds that show promise for making pears ripen more ­predictably. Pears are mature, but unripe and hard when they are harvested, and some varieties, such as d’Anjou, require a period of chilling in storage before they will ripen.Read more of the article by Geraldine Warner at Good Fruit Grower. PULLMAN, Wash. – Twenty-five students from a record pool of applicants for Washington State University awards in undergraduate research, scholarship and creative activities will each receive $1,000 to support their work. Zachary Reeves, a freshman in electrical engineering mentored by Amit Dhingra is among the award recipients. He will research custom algorithms to execute programs and analyze data in the genomics and biotechnology lab. Read the article at WSU News. When Dr. Amit Dhingra joined Washington State University seven years ago as a plant genomicist, one thing immediately struck him about the tree fruit industry. Apples were a 2-billion-dollar high-tech industry, and the cherry industry was also advancing quickly, propelled by new varieties and ­rootstocks. “These industries are on the move,” he noticed. “But in pears, we had not seen much advance in the last 100 years. It’s an industry which requires more application of knowledge so we can bring in change and transition.” Read the rest of the article by Geraldine Warner at Good Fruit Grower. PULLMAN, Wash. – Anyone who has bought a hard pear at the supermarket can probably attest to the fruit’s unpredictable ripening process. But that unpredictability, one of the many traits stored in the plant’s genetic code, could be a thing of the past now that Washington State University scientists have sequenced four new Rosaceae crop family genomes, including the Comice pear. Read more at WSU News.